The Short Coat mobile podcasting setup with an iMac, mixer, mics, amp and a headphone splitter. After years of using the Yeti usb microphone attached to an iMac I was inspired to get a better setup for podcasting by the local med school podcast The Short Coat and a podcasting setup at NCTE. When I first researched a more advanced podcasting setup I thought I would need a USB mixer, mics, headphones, mic amp, and a headphone splitter. 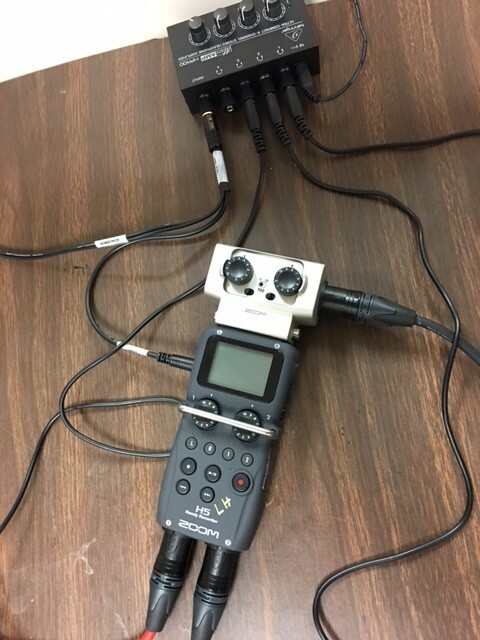 I didn’t choose to go with this setup after I observed a podcasting setup at NCTE with an H5 recorder and microphones that didn’t require an amp. I already have an H5 recorder and also liked the idea of going with a setup that didn’t require an amp for the microphones. The setup below consists of an H5 recorder, H6 adaptor for four microphones, microphones, headphones and a headphone splitter. The benefits are adjustable microphone volume, hearing podcasts while recording, and less background noise. After recording on the H5 the microphone tracks are saved on an SD card. Audio files are transferred to GarageBand for editing before being uploaded to SoundCloud. Once on SoundCloud the embedable podcast is posted on The Little Hawk. Here is their first recording talking about the new equipment. The old podcasting setup is still used with the Yeti microphone and laptop for in studio recordings of music. H5 recorder with an H6 adaptor for four microphones and a headphone splitter. Podcasting table with microphones, H5 recorder, headphone splitter, and mic stands.